Now we are moving a step ahead towards the Settings tab. Email Templates was discussed thoroughly in a couple of previous posts explaining the different templates and its usage. But have you thought of how these templates get sent to the customers automatically? Or how to track coupon code & its statuses ? It all happens due to the criteria set in the Settings tab. So let us understand the general settings of Abandoned Cart Pro for WooCommerce plugin. Let us look into each of these parts one at a time and study each of its parameters in detail. Enable abandoned cart emails – This setting allows you to send abandoned cart emails to the customers who has not completed their transaction. If you do not select this option then when any cart gets abandoned by logged-in users and guest users, reminder emails will not be sent to them. Cart abandoned cut-off time for logged-in users – This is the cut-off time set for logged-in users, after which the cart will get abandoned if the order is not placed. So, if the X minutes is mentioned and changes saved, the carts will be captured for logged-in users after X minutes on cart abandonment. Cart abandoned cut-off time for guest users – This is the cut-off time set for guest users, after which the cart will get abandoned if the order is not placed. Similar to cut-off time for logged-in users, the carts of guest users will be captured on X minutes which is mentioned after cart abandonment. Automatically Delete Abandoned Orders after X days – This is the number of days assigned after which the abandoned orders will be deleted automatically. This typically happens when the lost customer does not respond to the reminder emails for X days and hence the order sits in the cart for that long and finally gets deleted as per the settings. Email admin On Order Recovery – This is a very important setting as the admin will be able to keep track of how many abandoned orders have been recovered. This notification will be received by the admin automatically once the incomplete sale is completed. Hence for the admin to receive the email for order recovery, this setting has to be enabled by ticking the checkbox. Do not track carts of guest users – If you do not want to capture guest carts and visitor carts once these are abandoned, then this setting should be enabled. As per the requirements, you can even untick the checkbox if you wish to track the abandoned carts of guest users as well as visitors. Start tracking from Cart Page – When a customer enters no personal details after adding items to the cart then that customer is considered as a Visitor. Such customers like to hide their details while making a purchase hence when the abandoned cart gets captured for this user, there are no details of them. Therefore if this setting is enabled, the cart gets captured from the cart page as soon as he adds any product to the cart. Do not track carts of logged-in users – There is a provision for not tracking abandoned carts for logged-in users. You may think you do not want to know how many logged-in customers have abandoned their carts and instead want to know how many guest users and visitors have abandoned so as to focus on them for recovery of sales. In this case, you can decide to enable this setting. For instance: If admin is promoting some products via email newsletter then he can add the key as the user’s email address in the URL itself. So once the user opens the email and clicks the product to add it to the cart, his email address will be captured. Message to be displayed for Guest users when tracking their carts – This refers to the message that will appear on Checkout page and Email Address Capture pop-up for Guest Users. In compliance with GDPR, the message needs to be displayed for the Guest user to inform him about how admin will use his email address or other personal details entered. Message to be displayed for registered users when tracking their carts – The message entered here will be displayed for Registered users and will appear on the Shop & Product pages. In compliance with GDPR, admin needs to add this message on these pages to inform Registered users of how their data will be used. Reset usage tracking – When you click on this button, the site data which is sent to Tyche Softwares for plugin improvements will be stopped because usage tracking will no longer continue. The store owner/manager will then again be asked if they want us to track their data for performance improvements. “From” Name – The name that is entered in this field will appear in the email sent to the customer. Eg. Admin: when admin sends an email to the customer. “From” Address – The email address entered here is the one from which reminder emails are sent out. Please note that this setting is applicable when PHP mail function is used by Hosting Provider and not if SMTP mail plugins are used. If the mail configuration is based on SMTP, then this setting will not be functional. Send Reply Emails to – This is the email address to which the reply of the email gets sent to. Eg. If Admin’s email address is entered in this field then when customer clicks on Reply upon receiving the email, the reply will be sent to Admin’s email address. Product Image( H x W ) – You can set the dimension of the product image which appears in the abandoned cart reminder emails. 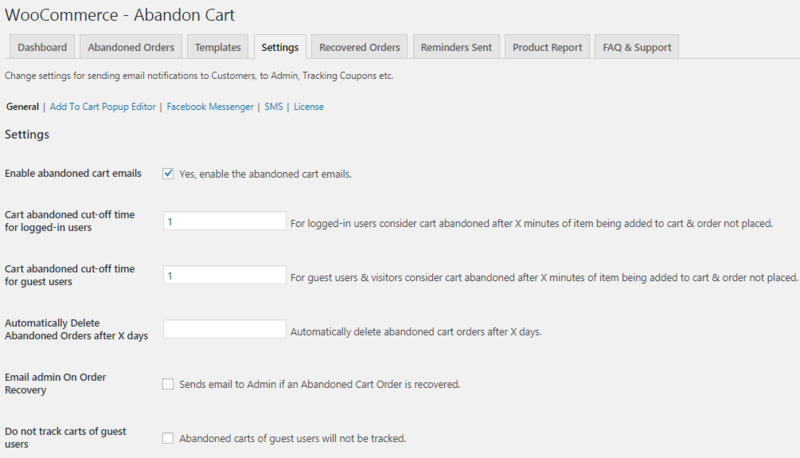 Send Abandoned cart emails automatically using WP Cro – If you enable this option by ticking it, the abandoned cart reminder emails will be sent automatically as per the set time. If this option is not ticked then reminder emails will not be sent automatically using WP Cron and needs to be set manually from cPanel. Now you would want to know what is WP-Cron and its function? WordPress uses WP-CRON as a virtual cron job. It is used to schedule tasks in order to automate actions like publishing scheduled posts, checking for plugin or theme updates, sending email notifications and more. By default WordPress is setup to call WP-CRON every time someone visits your WordPress website when a scheduled task is present to basically check whether it’s time to do anything yet. If you disable this option then reminder emails will not be sent automatically using WP Cron and needs to be set manually from cPanel. For more details and to set up the cron job, contact us. Run Automated WP Cron after X minutes – In this field you can enter the duration in minutes. WP Cron job will run automatically after this duration to send abandoned cart reminder emails and SMS to the customers. Eg. If you enter 2 minutes, then after every 2 minutes WP Cron will run and send reminder emails and SMS automatically to the customers. This is the time which has to be set first for automatically sending the reminder emails. Note: To optimize the performance of the site, Cron will execute in background as a queue process. It explains the rules to exclude capturing of abandoned carts, which is detailed in our next post. Whatever the options available in this plugin, it will only function properly if the settings for those options are set perfectly. Therefore the General Settings page helps you to make arrangements as per your requirements to best suit the Abandoned Cart Pro for WooCommerce plugin’s options for better productivity.